Directly following the Queen's (false) birthday this year was Hemelvaart (or Helatorstai (in Finish), Himmelfart (in Danish) or Ascension Day). It is the day when Jesus vaarted up to heaven after being crossed, buried and resurrected. Knowing hemel (pronounced heymal) mean heaven made me realise why the residents of Hemel Hempstead (in Hertfordshire, UK) are always so smug. They live in "Heavenly Hemp Town." Hotels spend a lot of effort getting you to go there and then even more effort making sure you don't stay there too much. Breakfast is always set at a prohibitive time for people who are on holiday. And after that, gangs of young people roam the corridors with large trolleys making much noise and knocking on any doors not marked with "do not terrorise" signs. Early breakfasts are, of course, ideal for old people (who suspiciously sleep very little) and other early birds. Because of the segregation policy, it was easy to see the fact the regular guests were very much out numbered by the senior citizens. I scoped out potential exits in case things turned nasty, especially those with steps, but it was soon apparent that these were contented seniors not out for a fight but all chirping contentedly around a well-stocked buffet tree. Ironically, even though it is celebrating the greatest journey ever told, there is actually very little in the way of transport on Ascension Day. Bike shops too are closed. If Jesus wanted to return to heaven in a modern Ascension Day, he'd have to hitch a lift, walk or ascend on a stairway of angels. Because there ain't no buses and he won't be able to rent a bike for love nor money. It was therefore time to take the valve between the teeth and the bell by the horns. We grabbed our new cycle repair kit, acquired a pump from the hotel and redesignated the inside of our bin as a bucket of water. In short, we fixed it ourselves. Refiets'd, we headed off into the relative wilds of the Dutch countryside. We started off trying to follow presubscribed routes, but somewhere along the way we diverged from this. But it wasn't all that long before we were back on a different path and all paths pretty much lead to the national park. Or away from it. Our route ended up taking us along more roads than woodland paths, but this gave us the discovery that the favoured pets in this part of the country are horses. We lunched on sandwiches prepared by ourselves sitting on tree stumps. Pretty much as primitive man would have prepared his sandwiches. Except perhaps his bread would not have been square and pre-sliced. And his ham would also not have been square and pre-sliced. Nor would he have found a perfectly flat (pre-sliced?) tree stump. He would probably also have been bothered by bears, wolves and demons, so on reflection, it wasn't quite the same at all. If horses are the favoured pets, goats seemed to be the favourite livestock. We passed many of the little blighters. Right before the park itself there was a petting zoo. A few chickens, pigeons (!) and pheasant-like things dwelt in a large cage whilst a pen contained several sorts of goat. Some were small and cute, others large and no doubt handy in a fight. I bent down and befriended a young example and seemed to almost immediately hit it off. 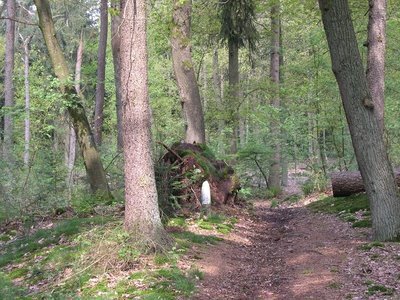 Nature, like most things in the Netherlands, is highly managed; and nowhere are cycle paths better maintained than in the national park. But then, they get more cyclists there most other places. As we had our own bikes, we didn't need to avail ourselves of the free, white bikes, but this is a great scheme. Once in the park, we cycled to the famous Kröller-Müller museum (named after a brand of yoghurt). We didn't have time to go in and round, but some pieces have been conveniently dumped outside. "Line of Rocks," "External Elevators," "Frenchman in the Vein of Alfred Hitchcock" and "A Bunch of Tubes Stuck Together" were the pieces I recall. We cycled on further and reached a snack outpost. We arrived just in time to grab fire-side seats before the hale came down. It threw itself down like, well, lumps of ice, bouncing off the thatched roof and soaking all manner of people. Very soon, the place was filled with damp groups jealously regarding our prime spot. The hale and thunder passed and we were soon back in the semi-wilds. We hadn't gone far when the storm came back round for more. We huddled in our waterproofs standing under the canopy of trees but not so close to the trunk that lightning would confuse us for something that might conduct better than wood. Fortunately it soon passed again. This was just before we arrived at the St. Hubertus Jachtslot (hunting lodge). This is a grand single-story building on the edge of a very large artificial pond. It looked like it could hold quite a few hunters. The lake had a low mist rolling over it as we arrived and looked suitably Arthurian. I could picture half-naked ladies emerging from the water, sword held aloft. About which Freud would have quite a lot to say, I'm sure. As we arrived, the downpour was just about ending. People were cowering in the doorways of the lodge and the mini snack bar next to it. Not very hunter-like, we thought. They looked like cowering peasants as we strode through in with our damp weather-armour. 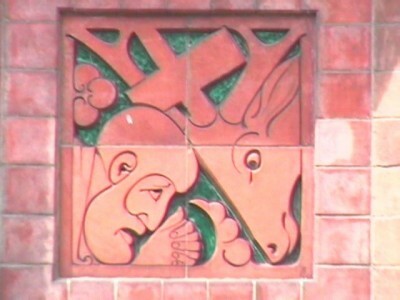 On the wall of the courtyard is a relief depicting St.Hubertus facing what seems to be a goat. In fact it looked remarkably like the picture of me meeting a goat that we took earlier. Where's my hunting lodge? Where's my Sainthood? Cycling back from the lodge, the sun came out highlighting the dramatic landscape and skyline of thick, black clouds. We were at this point in a large open area: Part sandy, part grassy it was like just the Serengeti. You could imagine lions chasing okapi with vultures circling above them. (Note: neither of us has been to the Serengeti.) In the middle of the plain was a statue of Anton Kröller stands on a plinth surveying his domain. He looks like he is about to lift off and soar into the sky for a better look at the world he bequeathed. We left the park and cycled back through the woods and farms. When we arrived at the hotel we were aching and wet; feeling we'd done enough exercising to last a few weeks. At least, I did. But the best thing was, our puncture repair was still holding on strong. For dinner, we had reserved a table at De Verassing because it was either that or what the Dutch think of as Chinese. We ate, chilled a little, reading, writing and drawing in the hotel's reading-writing-and-drawing room and then slept like two sore logs.